This year, Holy Week is in April, so the weather is likely to be nice and warm. Think about a few days off in contact with nature, learning about the world of wine. It sounds great, doesn’t it? Whether you are already a wine connoisseur or just want to become one, wine tourism offers you the chance to engage in a number of wine-related activities in beautiful natural settings. 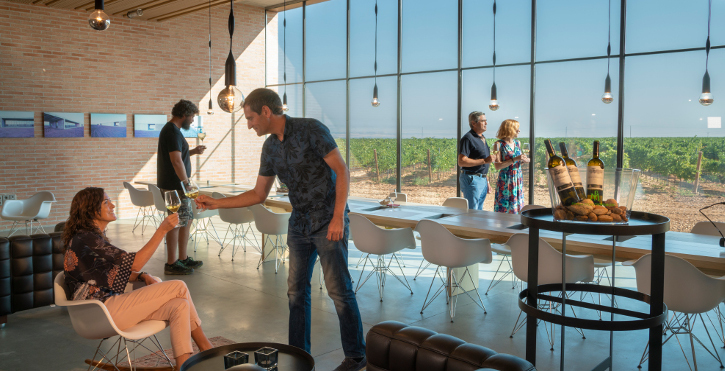 Enotourism – or, more simply, wine tourism – gives wine lovers the chance to visit wine regions and wineries, meet wine-making professionals and learn everything about wine-growing, wine making and storage. A visit to a winery can be much more than just a tour. You can walk between rows of grapevines while you learn everything about the natural environment, the grape varieties that grow on the vineyard, what life on the vineyard is like, and so on. At Familia Martínez Bujanda, we offer you the chance to explore our Estates and learn everything you want to know about them, as we unveil all the secrets of the wine industry, from grape cultivation and wine making to the glass. We have Single Vineyards Estates in different wine-growing regions in Spain, and all of them display the characteristics and reflect the essence of their own terroirs in their wines. Located in the town of Los Hinojosos (Cuenca), right on the Route of Don Quixote, Finca Antigua can be reached in a 90-minute drive from Madrid. The modern building, a symbol of contemporary, efficient architecture, stands in perfect harmony with the landscape and in respect for the environment. Lagarto Ocelado, Abubilla (including an off-road drive across the vineyard), 3 Tapas 3 Wines, and El Palomar (including a cold meal with one of the best Finca Antigua wines). Finca Valpiedra is located in the best area of Rioja Alta, formed by 80 hectares of vineyards divided into 3 natural terraces, that rest on the meander of the river Ebro. It follows the philosophy of Pago, better known as “Chateau”, and for this reason it is the only winery in La Rioja that belongs to “Grandes Pagos de España” (Single Vineyards Estates of Spain), a small group of wineries that defend the character of their terroirs. La Rioja is Spain’s most traditional wine-making region, and Finca Valpiedra has received the region’s entire cultural legacy of wine-growing and wine-making. This Easter season, you can choose from a number of tours: Modelo, including the tasting of two wines; Tasting from the barrels, with the tasting of two varietals right from the barrel; On the banks of the River Ebro, with a walk across the vineyard and a picnic at vineyards; Grandes Pagos de España, offering wines from other regions to taste; and Petra de Valpiedra, a visit to learn more about the new wine from the winery. Finca Montepedroso is right in the heart of the Rueda wine-growing region. Built with local construction materials, the facilities match the environment in harmonious coexistence. This winery only makes the authentic Verdejo, the most popular variety of this Appellation. Contact our Estates and check out tour times. This Easter, you cannot miss the experience of tasting our wines right on the sites where they have been produced!